From the Marcus and Dom bromance in Gears of War to Midna riding around on Link in Twilight Princess, Crispy Gamer explores some of the creepiest couplings in video game history. Crispy's list of the twelve most uncomfortable pairings is video game history is pretty much spot-on, echoing my own sentiments at every turn. 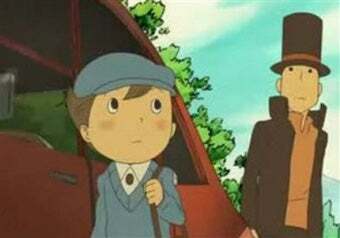 If you played through Professor Layton actively wondering about the professor's relationship with his young male companion, you've probably got the same sort of mindset. One that would make you question the relationship between Marcus and Dom in Gears of War. Poor Dom. My favorite uncomfortable pairing, however, would have to be number two on the list. The scariest videogame of the year doesn't have the words "Silent" or "Hill" in it. It's this game from the classy people at Activision. This is the first time in the series' history that the game actually features an Unlockable Ghost. That ghost is Kurt Cobain, who can be used — yes, that's the right word here — to create all sorts of uncomfortable pairings like these. Why not just go a step further, Activision, and include some autopsy pics as unlockables, too? I'd have to agree here - playing as Cobain was hands-down the most uncomfortable experience I've had in a video game. What could be even more awkward? Hit up the link below to see the pairing Crispy Gamer thought was more awkward than zombie Cobain.